I met a spaceman at the weekend. More importantly, my two little girls met a spaceman. Astronaut Chris Hadfield, who I posted about last May when he both entertained and inspired the world, taught my youngest daughter to shake hands for the first time at the age of five. I have no doubt that Chris Hadfield has completed many important tasks out there in space but one of the most important things he has done, in my opinion, is excite the people down here on Earth. And especially the children. I have never been to space and maybe I’ll never get there but all the way back in 2010, I began my own mission: to inspire and excite children about space. Through a funny cartoon show, I wanted to introduce very young children to the planets in our Solar System. The real planets, all of which are completely mind-blowing. Whole other worlds. And, for me, that was just the beginning. The idea behind Planet Cosmo is that it would spark questions. That kids could go back to their parents and ask, why is Mercury so cold at night? How many moons do other planets have? What other suns are out there? What other planets are there? The hope was that an interest would be ignited and that parents would recognise that and feed that interest. The show launched last year. Planet Cosmo has worked. It hasn’t yet spread internationally as quick as I would have loved (it is, however, already it is making its way to Finland, Portugal and Iceland). But wow, it worked. Right here in Ireland, I have had some of the most amazing mails and feedback from parents. The ones that make me smile the most are those where the parents got involved – made Solar System mobiles with their kids, for example. When it isn’t just about a kid but a whole family sharing in interest in space. Those are our future astronauts. Our future technicians, engineers. Even right here in little Ireland, software and equipment is being developed for space missions. In the future, who knows? Today’s kids could very well be astronauts. It’s more than just a dream. And right now, they are little astronauts. We are on a planet. In our Solar System. We are all in space. Making that known and igniting the imagination is so important. Our little astronauts are wonderful. So I thank Commander Chris Hadfield for doing a far bigger, better job than I could have ever done. I hope he has inspired your children, as he has inspired mine. His book is excellent, by the way. And if you haven’t yet checked out Planet Cosmo, give it a look. It’s often on RTEjr here in Ireland and there is a whole episode on YouTube below for anyone to watch. From here, I would love to continue that mission – to inspire and educate kids about space exploration and the awesomeness of it all. And I know it is a mission many others share so, who knows, there could be new partnerships, new concepts, new forms. I suspect I shall end up doing a lot more work for all our little astronauts. I certainly hope so. For those looking to find interesting space stories for their kids beyond Planet Cosmo, check out SEN.com and Discovery Space and there are some really good children’s books too, such as My Tourist Guide To The Solar System and the Illustrated Encyclopedia Of The Universe. Seek guidance. Don’t always act on it. One of the hardest lessons early on in a career is finding out that, actually, we don’t know everything. And, yes, we need to find out more. We eventually realise that our ignorance is not a strength (“I’ll bring a fresh approach by not knowing anything” – ahem, no). So what do people do with that realisation? It seems to greatly depend on what end of the business you are in. I have found that writers usually seek help, sometimes to a fault immersing themselves in books on Hollywood and structure rather than actually writing. To those writers, I say this – write more! But this post is for the others, often the directors, the creators, the developers, who tend to bury this realisation and continue to stumble along blindly. Why do we do this when it seems so obvious that we should learn from the research, successes and failures of others? I suspect it is because people in this position must constantly push so hard to open doors that their self-belief, whether real or as a persona, is crucial to getting ahead. To seek help or guidance could seem like a break in momentum. A step backwards. But breaking our momentum is sometimes essential. We need to pause to evaluate what we have, to make it better. And sometimes we need to take a step backwards to get a better look at what we have created. And to challenge it. To do that, we often need to seek guidance from those who have had their own successes and failures or those who have studied the lessons of the past. Those things we find out through trial and error others already know and we can bypass many obstacles by finding that out before we get there ourselves. This can work at all levels. People call me up for guidance on preschool, writing or production, for example, but I too will seek out guidance in many areas as I work. On Planet Cosmo, a valuable contributor was Educational Consultant, Brian Neish. Now I did my homework and research on the educational methods but actually having the assistance of Brian, someone who had tackled this area many times over, meant we could avoid common mistakes and make our educational portions even better. Seek guidance. Value it. Budget for it. It will make your work better. But don’t always act on it. This is the disclaimer. Not every piece of advice you get will be right for your project. In the fine print of any project development, it should say “be aware your work can get worse as well as better”. Guidance must be evaluated, considered carefully, and acted upon if it will contribute positively to your project. But I have seen some known names in the business miss the point of certain projects and offer guidance that negatively affected the end product. Guidance that, on another project, could have been gold. It is not that these people don’t know their stuff, it is just that every project is different and not every piece of advice applies in every case. By the way, that does not mean the process has been a waste – challenging your project just as a broadcaster or distributor will is incredibly important in building real confidence. If a suggestion can make my project a better version of what it is, I will gladly take it on and act on it. But if that suggestion is attempting to turn the project into something it is not, I will usually reject it. Be true to the project, whatever that may be. So seek guidance. Recruit top level people with experience to help. Value that, be open to it and take on any suggestion that will help make your project better. But in the process, never lose sight of what your project is. There were two subjects I was fascinated with as a child – space and dinosaurs. I thought perhaps that they were locked to their time (especially space with much more attention being given to space travel in the ’70s and ’80s) and that they were a boy thing (especially dinosaurs). My daughter Daisy became curious about dinosaurs at around three years old, initially from Peppa Pig’s Mr. Dinosaur (or, more correctly, George Pig’s). A conversation with me on what a dinosaur was led to a genuine interest. She became curious about space at around the same age, when she noticed the Moon one evening. Again, a conversation with me about it led to a genuine interest. Lesson 1: Talk to your children. Lesson 2: Girls in this day and age find dinosaurs and space fascinating. So I aimed to feed Daisy’s interest. Looking to books, I found a bunch of baby books (‘this dinosaur has a purple tail’) and quite a few very technical books for older children… but, at the time, pretty much nothing in between. Very little that was aimed at preschoolers and yet taught quality information on either space or dinosaurs. Talking with other children and parents, it seemed my Daisy wasn’t alone. Other children had these interests too. But, when interests aren’t fed, they quickly fade. And the world wasn’t offering what I needed to feed those interests in an age-appropriate way. So I decided to take action and do what I do – create. And the choice became simply: planets or dinosaurs? You know which one I chose. Several years later, Daisy was six years old and watching Planet Cosmo along with her younger sister Alice and, of course, with children across the country and soon the world. Today, I have added to my gallery some images showing the visual development of Planet Cosmo. I hope you find it interesting. I have mentioned before that, for young children, television is not one-way communication. No matter the form, even with traditional stories, kids love being involved and the more you can do to help them feel involved the better. What the team found was that children would readily take up the invitation to join in as James Earl Jones recited the alphabet and, on first watch, would say the letters along with him. But as children got more familiar with the segment and the alphabet, they would say the letters before James Earl Jones could. So it was clear that the segment did its job and children were learning the alphabet but what also came from that is that children love knowing what’s happening and they love getting in there first and getting it right. There is a real sense of empowerment that comes from knowing what the next letter is and that’s a thrill for kids. It is one of the reasons young children love a favourite story or will happily watch a favourite episode over and over. They adore knowing what comes next. They love the repetition. And it really engages them in communication. They aren’t just watching – they are taking part. This is the James Earl Jones effect. You can apply this no matter what form you are creating. For example in Planet Cosmo we engaged the audience directly and asked them questions, making them a part of the experience. Fluffy Gardens had a much more traditional straightforward narrative but, right from the first episode, there were sections written in that would repeat so children would begin to know the rhythm and know what’s coming. Even on first watch, there would be parts of an episode where the young audience already knew what was coming because we set it up deliberately for that to happen. And I knew those episodes could run and run. Far from getting boring, within our target age group, each repeat would become even more enjoyable. It’s all about character. That simple? It’s all about the character. It seems so simple when put like that. Certainly, if you see your job as selling merchandise, an iconic character design is essential. But there’s more to a character than that, right? For example, she may have an iconic design but does anyone know what kind of personality Hello Kitty has? Has lack of personality hurt her? Not hugely. Hello Kitty is an exercise in design. What about in the context of classic stories? The three little pigs – how much do we know about them? Well, we know they’re pigs, they’re builders and two of them like to cut costs. That’s more than we know about Hello Kitty but they’re still not exactly what you’d call well-rounded characters. But then what do I know about Dora the Explorer? She likes to shout. She’s neglected – after all, what parents in their right mind would let a young child out across the jungle with a monkey? And she has communication issues. The Map, for example, won’t talk to her directly and instead asks the viewers to tell her things. They must have had a falling out or something. Map probably didn’t like being shouted at. I actually don’t know a huge amount about who she is. What makes Dora tick? I remember when I pitched Fluffy Gardens, I showed the Paolo the Cat pilot. I was asked whether we had considered just making the whole show about Paolo. After all, he was such a great character. Character? I was puzzled. He’s a red cat. He’s clever and, em… he’s red. That is about as deep as Paolo was back at that time. He got considerably more fleshed out across the two seasons. The difficulty here is that, sure, maybe it is all about the character but what it is about those characters varies so greatly that finding the common ground is often very tricky. Hello Kitty’s appeal is straight from the visual design and little more. Dora’s appeal is more that she speaks directly to her audience. The appeal of the three pigs comes more from the story and the tension rather than anything specifically about the characters. Paolo the Cat actually had one underlying trait that gave him much more appeal than even I initially anticipated: modesty. The challenge? Appeal comes in so many forms. It must appear simple to the audience and yet can be incredibly difficult to achieve. It is hard to quantify. The solution? Don’t ever think of it in terms as simple as “it’s all about the character”. Character can be many things or sometimes very few things and character rarely exists in isolation. The process is complicated enough and there are so many aims and pitfalls that creating good content is never about any single thing. All aspects must be considered together. Design, personality, dynamic within a group of characters, story, mood, voice, sound, pacing and so much more. It is all part of creating appeal. See the whole and then pick and choose what is relevant for what it is you are creating. And if you do it right, even if you don’t know exactly how you did it, it will appear simple from the outside. So simple that someone with an interest will look at what you’ve created and think, it’s all about the character. By now, you will have all seen Commander Chris Hadfield’s version of Bowie’s Space Oddity, recorded and filmed on the International Space Station. It is truly amazing. More than two hundred miles above the Earth, a man floated in a tin can, played his guitar and sent a song down here to those of us still on the planet. My mind is still blown, not just by the amazing imagery, but the whole idea of this happening and what it means. This world is changing so much. Things we take as normal could be gone in a couple of generations and things we can’t even imagine could be part of everyday life. Don’t believe me? Okay, yes, I too am disappointed we don’t yet have flying cars and robot butlers. But just consider the effect of 3D printers. Right now, for several grand, you can get a device that prints objects. Actual objects. Sure, they’re expensive and are limited in what they can do but what about in ten years? 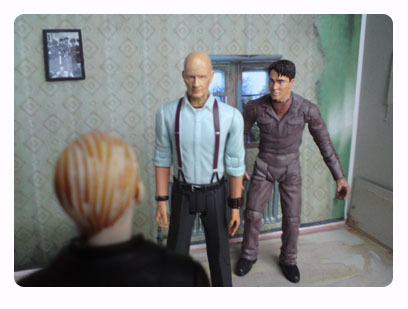 What if they’re in all our homes and capable of making much more than a pretty plastic model? Already the implications are becoming apparent with plans for 3D-printed guns hitting the Internet. More positively, we can print our own tools. Our own toys. Our own parts for almost anything. What will that mean for industry? What value will manufacturing have? And if manufacturing has no value and plans are shared freely, what value has creation? Innovation? How will our economic models that served us well during industrial times stand up to change of that magnitude? I don’t have all the answers. I am just using that one single device to illustrate the potential for society-altering change. Those of my age, of course, have seen such huge changes already. We are the generation who knows what it is like to live before the Internet and after it. I watch Mad Men and notice the lack of computers on the desks and I have to remind myself how we possibly got any work done without computers. So in a world where all is changing, what do we teach our children? What do I teach my girls? How about these ‘ creativity, adaptability, problem solving. All good. Empathy, the will to do good. Great, I can see already we’re going to need each other as our planet changes. A love of learning, a search for knowledge, understanding, focus. Absolutely. Change can be influenced, steered, and a greater understanding of our world, our universe and just who we are can help us direct that change towards the positive, helping to make our lives better. Inspiration and aspiration, the belief that we can do amazing things and are capable of things thought previously impossible regardless of gender, race or social standing. Yes, yes, yes. Commander Hadfield played a guitar in space and I think he has awed a whole generation. He entertained us. But he has done so much more ‘ he has inspired us. The International Space Station is just the beginning of an amazing journey. We can all play our part. I won’t get to space any time soon but I can inspire children to learn, to enjoy the wonders of our planetary neighbours. That’s why I created Planet Cosmo. It is entertainment first and foremost. Kids have to love the show, they have to laugh and smile and have to want to watch it. And they do. I have lovely mails from parents on how much their children enjoy it but those mails tell me the effect goes beyond the entertainment. My little show inspires – a love of learning, a new interest in space. I’m no Chris Hadfield but the reaction to the show tells me that our team at Geronimo Productions performed our space mission well. Our hard work paid off. And I have been so fortunate to work with such a dedicated team. As I prepare to leave Geronimo at the end of this month, something that will be one of the biggest changes in my own life, I reflect back on what we have achieved and I can smile. But I’m also looking to the future, at what awesome gifts we can give the next generation to entertain them and inspire them, to enrich their lives both as children and adults. It’s an adventure. Almost like packing my guitar and blasting off into space. Well, not quite. But exciting nonetheless. Thank you Commander Hadfield for entertaining us and inspiring us. And reminding me of two of the most important goals when creating content for children. There are huge challenges writing scripts for young children and I think many of them come from the simple reality of what we are doing – working with just words. Words can very quickly become abstract, lose meaning. As I went through in an earlier post, descriptions can fall away until you have just talking heads in a void and they all sound like the writer. I think a good test of character is whether you would know who is speaking if the names were removed. Do the characters think and act differently? Do they speak differently? We engage different parts of our brain when dealing with spoken word than we do when reading and writing. So just because something looks okay on the page doesn’t mean it’s going to sound okay when recorded. I write my stories out loud, saying each sentence over and over in different ways until it sounds right. I have done that since the very first Fluffy Gardens story and do it to this day. I’m not the only one. Ken Levine and David Isaacs (of Cheers/M.A.S.H. fame) dictate their scripts, working them out verbally as someone else types them out. But saying them out loud in your voice may not be enough. Writing in character voices is key to making those characters sound different, to get their personalities to come through in the dialogue. Because their voices will greatly affect the choice of words you settle on. If you’re just writing in your voice, you will pick words you will use. If you try words you would never use, they’ll sound awkward and weird. Put on a the voice as you write and you’ll very quickly find yourself putting sentences together differently. For example, I recently rewatched an episode of Planet Cosmo and found myself laughing at Lifter’s choice of words – “Are you sure, sweetie? I can rustle up quite a breeze!” I thought, oh that’s good, I would never use the phrase “rustle up”. Then I had to remind myself that I wrote those words. But in a way, I guess Lifter said them. I just listened and wrote them down. So it’s really important to write in character voices. But I would take this a stage further and say that those of us reading scripts (script editors, producers, directors etc.) should try to read in character voices. You might not yet know exactly how they should sound but give it a go based on what you know of the characters. It will make those lines read very differently. For example, Cranky in Punky (written by the wonderful Andrew Brenner) has lines that can look very harsh and not age-appropriate on the page. But Cranky’s voice (Paul Tylak) gives her a comic quality that completely disarms the lines and makes them work beautifully. They become very funny. Similarly when I wrote Dad in Planet Cosmo, some of his lines looked rude, selfish and sometimes even mean. But say them in Dad’s voice and they become light and funny, losing their weight. How those words sound out loud in a character voice is what counts – that’s what children will hear. It is always a challenge to make characters work and a greater challenge to make them work well. Working with the character voices is a way of helping their inner personalities and differences come out, and a great way of getting those words on (and off) the page. 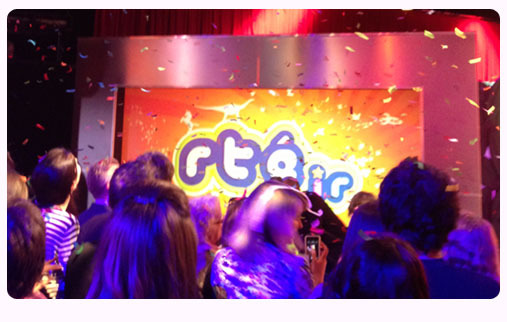 On Monday, I attended the launch of RTÉjr, Ireland’s new dedicated children’s channel. Broadcasting twelve hours a day, the channel brings content directly to Irish children, expanding what was once a block on RTÉ2 into a full channel sitting along with all the other children’s channels on Sky, UPC and Saorview. Now I should point out that I have five shows currently airing on the channel so it’s likely I would say some pleasant things about it – I have been referring to the channel as my ‘showreel’, after all. But there is more to RTÉjr than just being a place to catch some of my shows. It is a dedicated children’s channel focusing on children aged seven and under. I have previously expressed my appreciation for dedicated children’s channels on this site. I feel they give parents more control, lessen the risk of inappropriate content and they simply make it easier to pick and choose what our children watch. It is a channel focusing on delivering specifically to Irish children. Local content is so important to children. Each country has its own culture, its own ways of looking at the world. That unique point of view should be represented in the shows kids watch. Anyone in children’s content will know just how difficult that is to achieve ‘ most shows need to be sold all over the world to stand a chance of breaking even so how can they be culturally specific? Well, that’s why local content in any country needs support. RTÉjr has, yes, content bought in from abroad but it also currently carries a large amount of content created here in Ireland for Irish children. For example, one of my own shows now airing on the channel, Ballybraddan, is about Irish children playing hurling, an Irish sport. That show just couldn’t be made anywhere else. And it is wonderful now to see it sitting in the schedule, seeing it among the NickJrs, the Disney Juniors and all the other juniors. And RTÉ’s own produced content (of which I am not involved with) has jumped in quality recently and the level of talent has risen. So it is not just content tailored for Irish children, it is better content for Irish children. The biggest part of this whole channel for me as a parent? RTÉjr carries no advertising. None. It was so encouraging to hear RTÉ’s Director General, Noel Curran, focus on that point at the channel’s launch on Monday, calling the lack of advertising a strong statement and positive for parents, while expressing his and RTÉ’s commitment to children and the new channel. So what we have now with RTÉjr is an ad-free channel, focused on children aged seven and under, delivering some uniquely Irish content that children just can’t get anywhere else. As a creator, a producer of content, RTÉjr offers a home for existing content and makes it much more accessible for our audience. With the channel sitting in the Kids section, it is now far more likely that children and parents will see our shows, take a chance on them over some of the more international content. It also creates a need for new content. The challenge laid down by the channel and the commitment is to keep it relevant, keep it current. Oh there will be budgetary constraints (there always are), but this channel will need content as it evolves. And with such a strong start, I am looking forward to seeing the channel grow. The launch event was tons of fun. 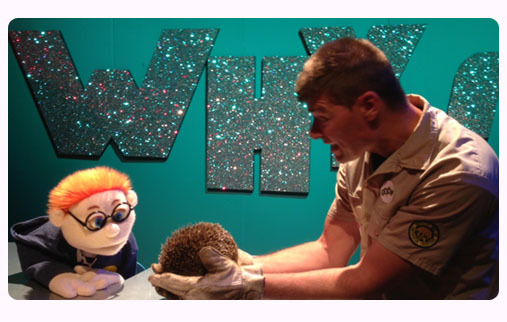 I got to meet Reuben and Bó Donie (who, as a children’s presenter, I was very impressed with ‘ this guy could be the Irish Justin Fletcher) and almost got to pet a hedgehog before his minder told me he gets a bit bitey. And my girls have been testing out the channel for the last couple of days and have been enjoying it immensely. So congratulations to Sheila DeCourcy, RTÉ’s Cross-Divisional Head of Children’s Content, and all her team on a great launch, a strong schedule, and for giving something really positive to Irish children. If you’re in Ireland, you can find RTÉjr on Saorview (Channel 7), UPC (Channel 600) and Sky (Channel 624). For my own shows, you’ll find Fluffy Gardens at 1.15pm and 4.55pm, Planet Cosmo at 9.05am and 1.40pm, Roobarb & Custard Too at 11.05am, Punky at 8.40am and Ballybraddan at 6.15pm. But be sure to check out some of the other excellent Irish content on there too ‘ Beo Show, Garth and Bev, Why Guy and more. My path to writing stories for children has been a very visual one – animation, storyboarding, directing. Along the way, I have seen some wonderful scripts and have been very fortunate to work with some excellent writers. But I have also seen many submitted scripts that would be almost impossible to produce, some that make little sense and I have heard numerous complaints from animators about writers who just don’t think visually. Many on the animation side, for example, preach the value of forming the story through storyboards rather than words on a script. Even with my visual background, when I moved into writing I embraced the words. The language. I love language and the flow and the rhythm that words can bring and I have done since long before I got into television. I don’t believe the value and power of words should ever be underestimated, even in preschool entertainment. But early in my career, I was writing a script and something went wrong. Something was missing. I didn’t quite know what it was. It was while working out another basic story problem, remembering that a character could use a wrench left in an earlier description, that I realised what had happened. That wrench had been there all along. But I didn’t see it. I didn’t see anything. I had lost the picture. I was now dealing in just words. Oh there were descriptions but I was no longer really seeing anything. It was a whole lot of spoken dialogue in darkness. The actions seemed abstract, lost in the darkness, and even the characters were nothing more than mouths to deliver dialogue. I was not writing visually. I have since seen that same thing happen in the scripts of others and even in books and what I have found is this – the more words we write, the more risk there is of losing the picture. You can have great dialogue and really play with those words and that’s great but you have to have a complete visual picture. More than that, you have an opportunity to create something wonderful with those visuals, an opportunity that should not be wasted. Think of some of the defining imagery in movies – the long spacecraft Discovery in 2001, getting the yellow bus moving in Little Miss Sunshine, pushing into the wind in Babel. Imagery so iconic, it often feels the rest of the movie is built around it. It is no surprise so many of those moments end up on the posters. Does it happen in preschool? Sometimes. It does now when I write it. Almost all of the series 2 Fluffy Gardens episodes are based on a single core image – a huge field of flowers, cycling over a hill framed by a rainbow, a little boat sinking in a vast ocean. The same is true for Planet Cosmo. If you know the episodes, you’ll recognise some of the scenes in the sketches above, done before the stories were ever written. And it has value to young children as each episode becomes special, a completely unique event even in a format as structured as Planet Cosmo – the episode with the tiny pieces of ice floating in space, the episode with the raging red storm, the episode with the room full of glowing stars. Iconic visual moments unique to those episodes. So how do you stay visual while writing, dealing with just words? Well, my advice is: don’t deal with just words. Sketch and doodle as the story forms. Try to define some of those key moments in advance. Keep those drawings close. No matter how good or bad they are (nobody ever has to see those drawings), they will help you keep your visual picture. There are other ways too. You could trawl Google Images for locations similar to those you’re writing about. Print them out and place little cutout characters on them. For one feature script (keeping in mind that the more we write, the more the risk of losing visuals increases and a feature requires much more writing), I actually made myself a little playset, customising figures to match the characters in the story and building a basic set from cereal boxes. You don’t have to go that far. But do whatever it takes to keep hold of those visual images and create those iconic moments. That way, you’re taking the best of both worlds – staying visual like those who create their stories through storyboards while embracing your passion for words and language. Be wary of getting lost in the darkness. Stay visual.